This amazing 12,000 sq ft apartment has been all over the blog world (found via Perfectly Put Together, via MadeByGirl) and I just cant get over it. The use of color, pattern and texture here is right up my alley- I am just smitten with it. SO funny, I posted about this picture this week too! I dissected the room and showed how you can recreate it! oh yep. this place is making its rounds. its fantastic!!! totally digging this room! I need that table! Love it and all the color. I just went and looked at all the pictures...I may have to go back again! We did the carpeting and rugs for it. Jan Showers is the designer, and her work is so glam and fun. In fact,the table is one of her designs. I'm not usually a fan of the neons out there but this place I could just move right into! 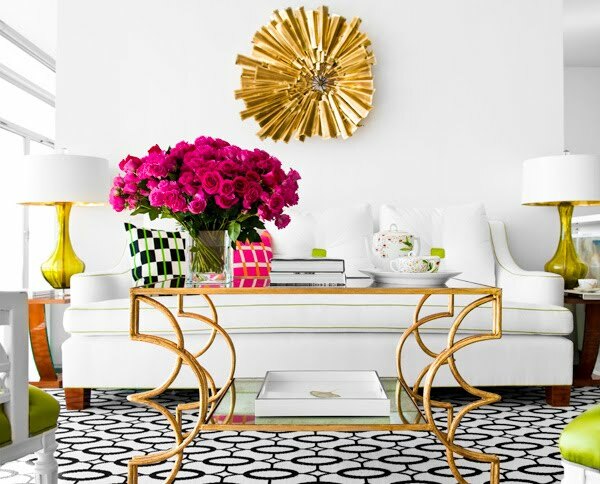 Now I want to change my black coffee table to gold. I think a project is in the works! I've seen this image a few times over the past week and I'm yet to tire of it. I literally fall in love all over again each time!